The appeal of cabbage juice lies not in its taste, which is rather bitter, but in the many health benefits you can derive from drinking it. A member of the healthy cruciferous family of vegetables that also includes broccoli and cauliflower, cabbage contains a wealth of micronutrients as well as a wide array of phytochemicals with a similarly broad variety of medicinal properties. Consult your doctor before self-treating with cabbage juice or any other home remedy. Cabbage juice is a traditional treatment for peptic ulcers since it supports the mucosal linings of the gastrointestinal tract, explains Ann Louise Gittleman, a certified nutrition specialist. The juice is also rich in sulforaphane, an antioxidant that targets Helicobacter pylori, a bacterium implicated as a causative factor of peptic ulcers. 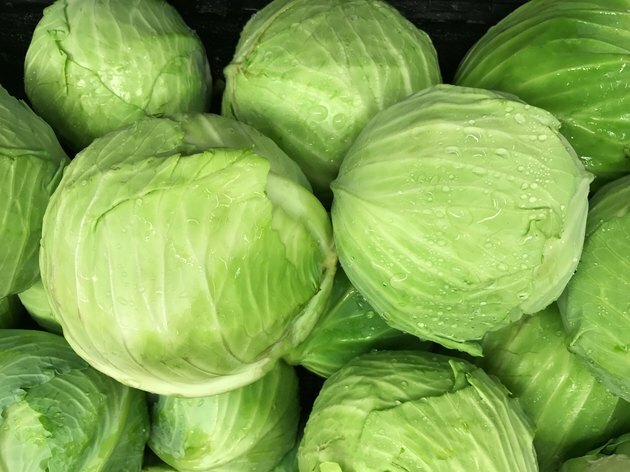 In a particular study, ulcer patients were able to heal their ulcers within 10 days by drinking a liter of cabbage juice daily, reports Gittleman. If the prospect of that much juice is somewhat daunting you can have a glass with your lunch can help protect your GI linings against ulcers. The phytochemicals in cabbage juice help soothe the gastric lining and provide relief from the symptoms of acid reflux. In a Japanese study exploring the cholesterol-lowering properties of cabbage and broccoli juice, scientists assembled a study group of 77 adults diagnosed with mildly to moderately elevated cholesterol levels. Half of the subjects received two cans daily of mixed fruit and vegetable juices, with broccoli and cabbage juices making up the majority of the content; the other half received two cans of mixed fruit and vegetable juice that contained no broccoli or cabbage juice. At the end of the 12-week study period, test subjects who received the broccoli and cabbage juice mix showed a significant reduction in blood levels of low-density lipoprotein, the so-called bad cholesterol. Cruciferous vegetables such as cabbage have cancer-preventive properties. The phytochemicals in cabbage — and its juice — stimulate your immune system, which helps fight off all forms of illness, including cancer, explains Phyllis A. Balch, a certified nutritional counselor. The phytochemicals inhibit the growth and spread of cancerous cells and protect against tumors. That's not all — research from the Francis Crick Institute in London revealed that a diet rich in indole-3-carbinol (a chemical produced when cruciferous vegetables such as cabbage, kale and broccoli are digested) may protect against gut inflammation and colon cancer. Consider adding cabbage to your favorite juice mix for a gut-healthy, anti-inflammatory kick! Cabbage juice produces no significant side effects, although some users note an increase in intestinal gas. If this poses a problem, dilute the cabbage juice with water on a ratio of one or two parts water for every four parts of juice. You also can make the juice more palatable by juicing an apple or two carrots along with the cabbage. Do you like cabbage? How often do you eat it? Let us know in the comments!